A startup company, founded by a former Bellevue student, would split the cost of a down payment for teachers and other school staff — provided they agree to share a quarter of any profits made on the sale of the property in the future. Bellevue teachers — who banked on double-digit pay hikes starting this school year — still might not find it easy to live on the Eastside. Median home prices in and around Bellevue are nearing $1 million, meaning new teachers in the Bellevue School District, even if they saved a full tenth of their salary each year, should expect to wait roughly 34 years before they would be able to afford a 20 percent down payment on an Eastside house. Even teachers earning the max salary in Bellevue — just under $111,100 — would have to save until 2032. The school district has started talks with Eastside developers to see if they can make room in mixed-use buildings for affordable units for educators. But on Thursday, district officials announced another potential solution: A startup company, founded by a former Bellevue student, would split the cost of a down payment for teachers and other school staff — provided they agree to share a quarter of any profits made on the sale of the property in the future. And to get it done, Bellevue this week announced plans to partner with Landed, a San Francisco-based startup that helps educators foot the bill of a down payment on a home, in exchange for a split in future profits and losses on the investment. It’s the first such partnership in the Seattle area. The company, founded in 2015 by Sammamish High School graduate Alex Lofton offers teachers and other school staff up to half of a 20 percent down payment on a home — 10 percent of the property value, up to $120,000 per family. 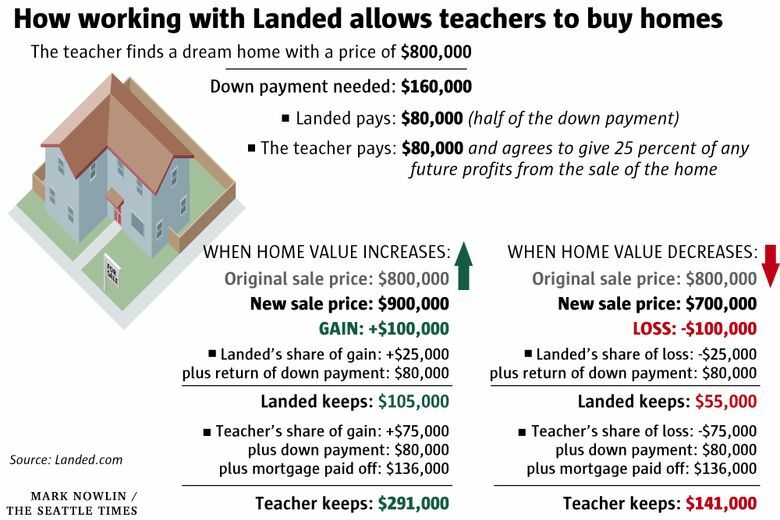 Teachers cover the other half and, if they ever sell the home, give up 25 percent of the profits to Landed. If the housing market slips over time, Landed would cover a portion of the losses. Lofton and Thomas both said the district has no financial stake in the arrangement. Already, Landed has helped educators buy homes in and around San Francisco and Los Angeles. And Lofton said he’s gauging interest in Seattle Public Schools and other King County school districts. Lofton acknowledged that in Bellevue, teachers still would have to come up with nearly $100,000 to take advantage of his company’s program, and that not many teachers have that kind of money in the bank. His company initially secured funding from individual investors before attracting money from the Chan Zuckerberg Initiative, created by Priscilla Chan and her husband, Facebook founder Mark Zuckerberg. Ben Walton, of the family behind Walmart, also invested to expand Landed in the Denver area. In cities across the U.S., school districts have experimented with similarly creative solutions to help teachers afford to live near their schools. School officials in San Francisco, for example, plan to build 100 to 150 below-market housing units for educators in a $44 million partnership with their city. Other districts have offered home-buying grants to attract teachers to places with rising housing costs, or provided modular homes rent-free. Frank Ceteznik, an agent with John L. Scott Real Estate, said he didn’t see any risks. 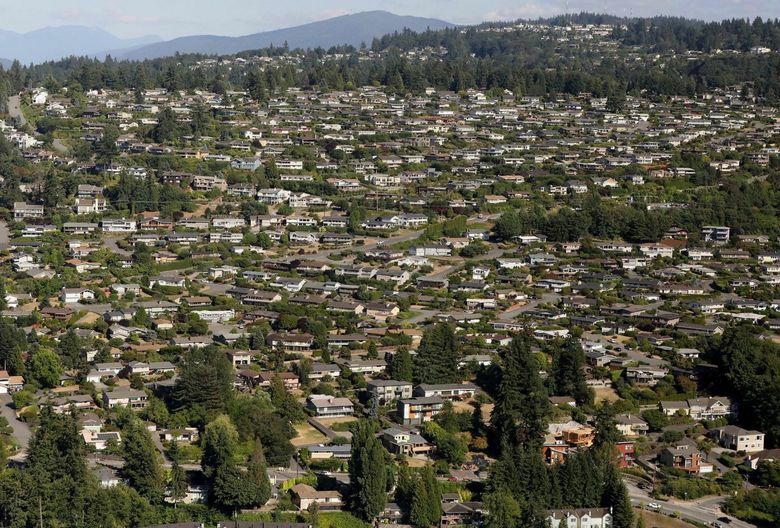 “It’s a new financial product we’ve never really seen up here,” said Ceteznik, who started in real estate 22 years ago after teaching for 31 years in Bellevue and Mercer Island schools.